Get the lowdown on these popular window treatments, from styles and materials to must-know measurement and install info. To filter the light that enters your home and control your level of privacy, you can’t go wrong with blinds. These easy-to-adjust slatted window treatments can be pulled out of the way for an unhindered view or closed completely to ensconce you. 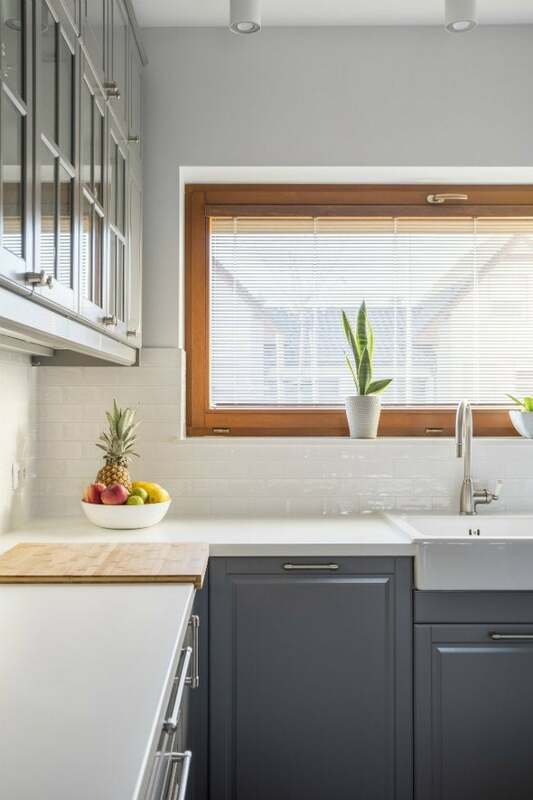 Since blinds are available in a host of sizes, materials, and price points, we’ve got the scoop on how to determine the best choice for your home—and how to install blinds in any window. Blinds are made from “hard” materials, such as vinyl or wood, as opposed to shades, which are constructed from fabric. Horizontal blinds feature individual slats, while vertical blinds have “vanes,” the term for slats that hang vertically. Horizontal or vertical blinds can be a stand-alone window treatment or paired with curtains for a softer effect. 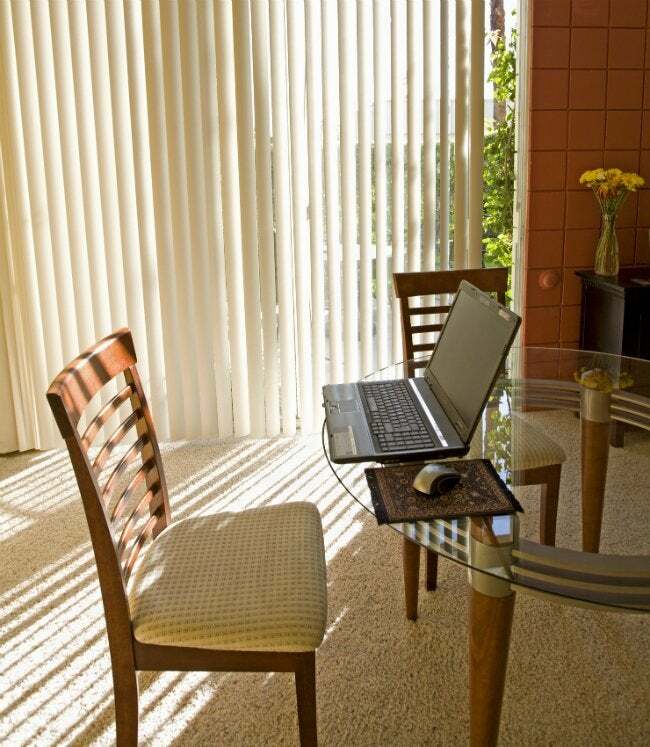 Horizontal blinds work well on small, narrow windows to add visual appeal while controlling light and privacy. They’re less desirable on expansive windows where the wider span can cause blinds to sag in the middle. Horizontal blinds feature individual slats that overlap when the blind is fully closed. By twisting a wand that controls a series of connected cords, you can adjust the slats to let in as much or as little light as you choose. 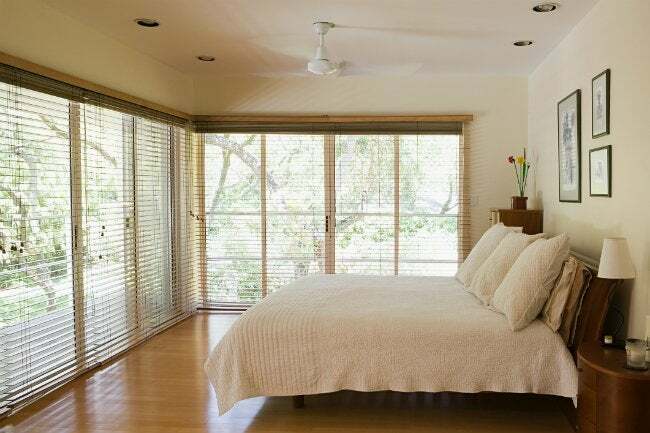 Horizontal blinds can also be raised or lowered as desired. “Mini” blind slats are approximately ½ inches wide, while retro-style slats can be up to 3 inches wide. You can go as wide as you like, even with blinds installed inside the window frame as long as the slats fit without protruding past the frame. Basic horizontal blinds can cost as little as $15 for small windows, but you could pay $200 or more for custom blinds or those for large windows, depending on material choice and quality. Vertical blinds, which feature a top track from which individual vanes hang, won’t sag, so they’re great for sliding glass patio doors and wide windows. Many vertical blinds can be slid aside using a wand; the wand can also be twisted to rotate the individual vanes, adjusting light flow. Some vertical blinds operate by pull cords located on one side. Like horizontal blinds, vertical versions come in a wide range of material choices and prices, from around $50 for no-frills models to more than $400 for custom orders and higher-quality materials. Safety Note: Long pull cords pose a known risk of strangulation to pets and small children. Many blind manufacturers have voluntarily done away with them, but some pull-cord models remain on the market. For anyone with toddlers at home, the best choice is cordless blinds that feature an alternative operation method, such as a push-button lift mechanism in the bottom rail. Blinds are available in a host of materials to suit your taste, needs, and pocketbook. • Vinyl is a top seller because it’s inexpensive and easy to clean, and you can choose from a variety of colors and sizes. Vinyl blinds are the most economical, ranging from $15 for light-gauge vinyl for a small window to more than $100 for larger sizes or heavier-gauge vinyl. • Wood blinds add a warm, natural look to a room and come in many popular finishes, including oak, walnut, cherry and mahogany to match your trim or furniture. Prices range from $35 to more than $200, depending on window size and wood type. • Faux wood blinds, made from PVC or a composite material, closely mimic the real thing, but they resist humidity better than wood, making them a smart choice for steamy bathrooms. Prices range from $15 to $100+. • Sleek aluminum blinds give windows a contemporary look. Expect to pay between $20 to $100+, depending on size. • Specialty blinds offer optional material features, such as fabric-wrapped slats or increased light-blocking ability. Prices start at $20 but vary widely, up to $400 or more for fabric-covered custom slats or vanes to match curtains or upholstery. Precise measuring is crucial if your blinds are to operate smoothly and effectively block light. You’ll not only measure the width and length of the window or door frame, you’ll need to “round down” or add as directed below for proper fit and function. Before you begin reading your model’s specialized set of instructions on how to install blinds, decide if you want inside-mount blinds that install within the window frame or outside-mount, which attach to the wall. If you prefer the look of inside-mount blinds, your window frame’s depth must be able to accommodate them. Measure the depth of your inside window frame and check the blinds’ minimum depth requirement (listed on the product specifications) to ensure fit. If you’re ordering custom blinds, the company will cut them to your specs; DIY stores will also cut blinds to fit your window’s measurements. • First, measure the inside width of the window frame at three different spots—the top, the bottom, and in the middle. It’s important to measure all three areas because window framing can be out-of-square, even if you can’t see it with the naked eye. 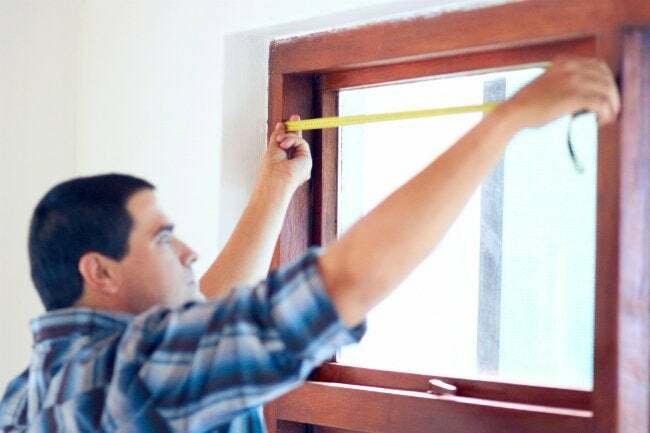 Record the shortest measurement to ensure that you won’t end up with a blind that’s too wide to fit in the tightest spot of the window frame. • Next, measure the height of the inside window frame in the same manner, from top to bottom on the left, then on the right, and again in the center. This time, record the longest measurement to make sure that the bottom rail on your new blind will be long enough to reach the windowsill even if there is a discrepancy in the window framing. • Now, round both measurements down to the nearest 1/8” increment. For example, if the width measurement is 18-15/16, round it down to 18-7/8”. Likewise, if you came up with a length of 30-3/16”, round it down to 30-1/8”. Rounding down the width measurements allows for a small space on both sides of the installed blind—just enough to pull it up without rubbing the window frame, while still offering maximum privacy and light control. The precise length measurement will ensure that the bottom rail will rest a hair above the windowsill, without laying on the sill itself, when lowered to its lowest position. • Measure the width of the window at the top, from outside edge to outside edge, and then add 3 inches. • Measure the length of the window in the center and add another 3 inches. The extra inches are necessary to ensure sufficient light blockage and privacy around the edges of the blind. • Measure from the top of the door frame to the floor. Add 3.5 inches to allow sufficient room to install the track 4 inches above the top of the door frame, while keeping the bottom of the vanes ½ inches above the floor, so they won’t drag when you slide the blinds. Many vertical blinds require 4 inches above the door frame to accommodate the track. • Measure the width of the door from outside edge to outside edge and add 4 inches. The extra width will block unwanted light from the sides of the blinds. 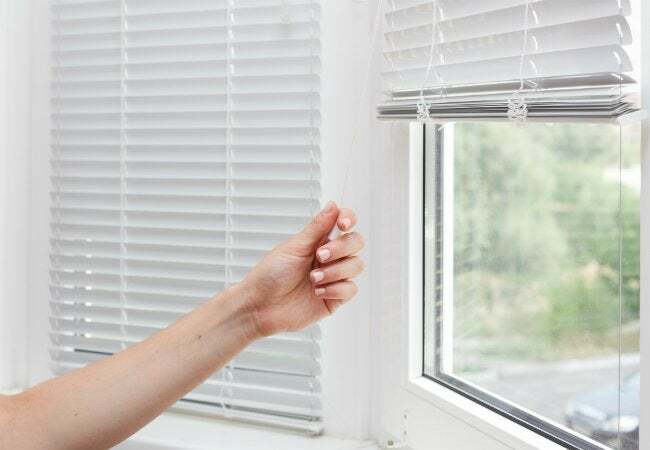 The blinds you buy will come complete with all hardware you need including brackets and screws, but a drill and a Phillips head drill bit are generally required for installation. The standard process for how to install blinds is to attach the brackets that will hold the blind, either inside the window frame (for inside-mount blinds) or on the wall on either side of the window (for outside-mount blinds). Especially wide blinds often come with an additional center support bracket to keep the middle of the blind from sagging. Once brackets are in place, fit the upper rail of the blind into the brackets (for horizontal blinds) or hang the vanes on the upper track (for vertical blinds). Both horizontal and vertical blinds often come with a finished front piece that snaps in place over the top rail to cover the brackets and give the blind a finished look. Keep in mind that installation varies by type and brand, so follow the manufacturer’s instructions carefully. 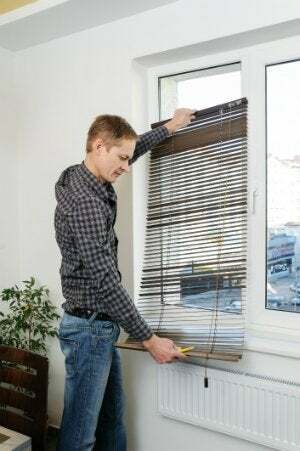 Blinds do collect dust, so care for them regularly to keep them looking new. • Swipe all blinds periodically with a microfiber duster or a blind-dusting tool designed with “fingers” that fits between individual slats. • For occasional deeper cleaning of vinyl, composite, or PVC blinds, lift them from their brackets and take them outdoors. Spray with all-purpose household cleaner and wipe the slats with a damp cloth. Rinse with a fine spray from your garden hose and allow to dry completely before re-hanging. • For wood blinds, lightly mist with furniture polish and wipe each slat or vane clean with a soft dusting cloth. • Vacuum fabric-covered blinds with the brush attachment to banish dust, but leave spot-removal and deep cleaning to a professional cleaner.